Ten years ago, Scans_Daily was first treated to the adventures of "Batman and Sons", by the artist known as The Black Cat. Sort of inspired by Tiny Titans, but going in it's own awesome directions very quickly, it's the story of Batman raising three Robin's and a Batman Beyond at the same time, and I realised that newer members of the board might not be familiar with them, and frankly, every Bat-Family fan should. Not in the stuff and serve for dinner sense I hasten to add, but they are the usual birds to see on Christmas cards and imagery. It's been a pretty bloody awful week all things considered, the tragedy in Orlando, the murder of a British MP, the general political situations on both sides of the Atlantic (and elsewhere in the world of course) and my mood is definitely not helped by the latest news about Anton Yelchin passing away. As such I am using the BIG guns to celebrate Father's Day because I think I need to. Since it was on January 12th 1966 that the Batman TV series started, I had an idea to make a post, and I probably will too, before the day is out, but I've niow discovered that one of our most beloved fan-artists has beaten me to it. The Bat-clan are very easy to fit into Hallowe'en, since there are enough actual kids in it, to make Trick or Treating, not an innately weird or creepy thing for them to do. A little while ago we celebrated Mother's Day, and I've now been reminded that this weekend is Father's Day so it might be nice to celebrate it in best Scans_Daily fashion! The Black Cat has a new "Batman and Sons"! 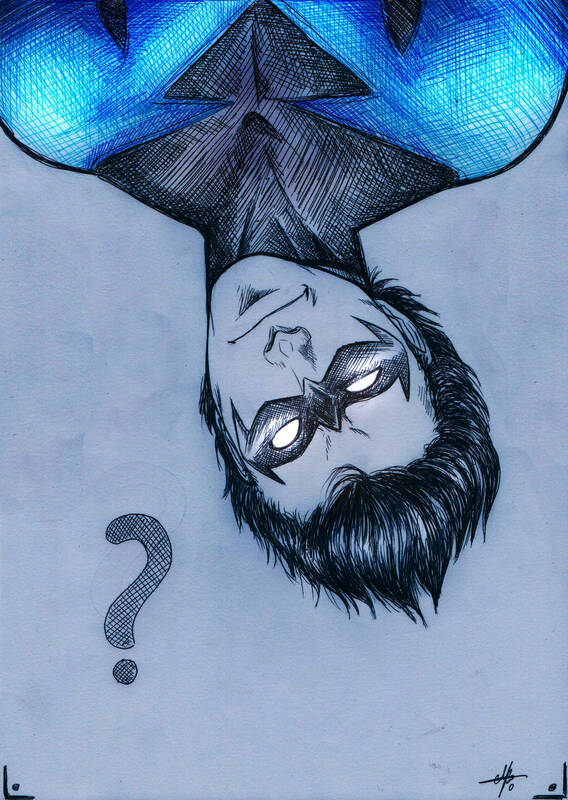 What does curious Nightwing (by mayhw on tumblr) see under the cut? The_Black_Cat has released a couple more Batman and Sons strips, which is a nice way to strt a Tuesday morning..
as the Black Cat is about to demonstrate in the latest Batman and Sons. I somehow managed to not pay attention to the fact that DC Comics have declared July 23 "Batman Day", to celebrate 75 years of his publication.... I feel slightly embarassed about that, as I should have thought to propose an event in advance.